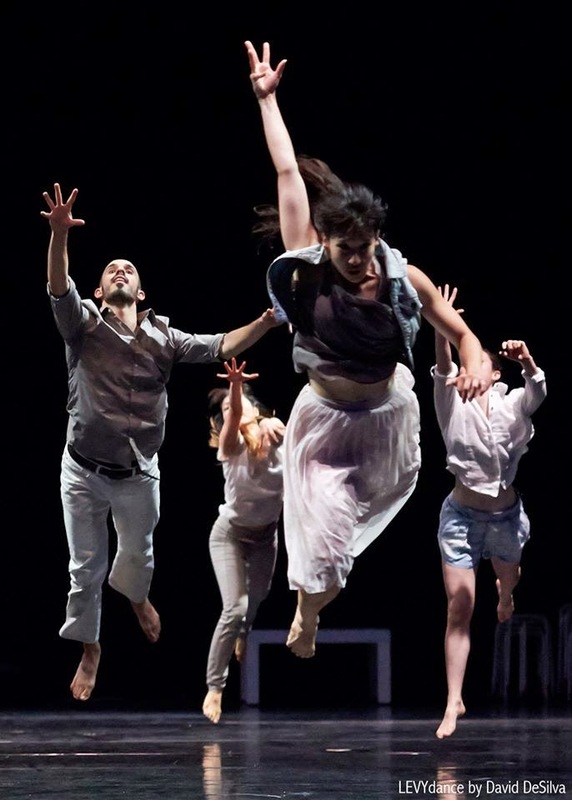 Dance Commentary by Heather Desaulniers: "Soar"
The contemporary choreographer is charged with a multitude of tasks, one of which is the search for project collaborators. Composers, costume designers, set builders, dancers, musicians, visual artists – a whole team of individuals is usually required in order to bring an idea to the stage. But the most important consideration in this quest is that each chosen collaboration makes sense for and in the work. Seems obvious. Yet, there are so many multi-disciplined productions, with collaborations (while interesting and artistically challenging in their own right) that simply do not contribute to the dance in question. Instead, they read as a peripheral afterthought, unrelated stimuli, not at all integrated into the piece. LEVYdance’s newest evening-length production, “Soar”, directed and choreographed by Associate Director Scott Marlowe, is all about collaboration, and his concept worked. Ben Juodvalkis did an original score; Amanda Ramirez, the costumes; Grant Diffendaffer, the set design; eleven dancers performed; three additional choreographers contributed movement vocabulary. But the most significant collaboration was also the most unusual and the most risky – that between “Soar” and its audience. Throughout the fifty-minute piece, the audience was asked to make decisions that ultimately defined which performance they saw. Viewer choice and responsibility transformed every audience member into an ‘active’ collaborator, and it paid off. Each individual’s experience with “Soar” was unique, and the following description outlines my journey through the work. Upon entering the space, the audience encountered seating arranged on the stage, in the round, with specific stools designated for the dancers. So, the first choice was how close (or far away) you wanted to sit from one of the performers. As the lights rose and “Soar” began, flying sound effects underscored the first wave-styled movements. Starting seated with just the upper body, these reactions and adjustments quickly crescendoed to standing and next, to a running circuit. The set of concentric circles created a real-life oscillating fan, complete with a palpable breeze. Following this motif, the cast of eleven was parsed into solos, duets, trios and quartets all over the stage space. And again, your original choice of seating determined which of these dances would be visible to you and which would be obscured. Trust and vulnerability were common in each excerpt, though the scope, intention and dynamics varied greatly. Three women center stage exuded a sense of urgency and passion while the upstage quartet’s ‘domino’ falls gave way to calm and acquiescence. Then, Marlowe, Michaela Burns and Yu Kondo Reigen (the three LEVYdance company artists) cycled through a choreographic phrase that spoke of penetrating desire. As that first chapter came to a close, the performers led each audience member to a new vantage point, simply asking them to choose ‘red’ or ‘blue’. While in some cases, these longer transitions can break the momentum of the work, in “Soar” the participatory exercise allowed for a smooth, real and organic progression to the next section of the dance. Once everyone was seated, the center black curtain closed, dividing the space in half and determining which of the two choreographic sequences we would see, and which one we would miss. On the ‘red’ side, a casual, yet genuine game of ‘spin the bottle’ emerged while first one, and then two performers remained outside of the circle. The game continued while Marlowe and Reigen engaged in a dramatic yet playful pas de deux. Each of the two groups was sharing the same space, but they were entirely separate and somewhat unaware of each other. There was a relatable sense of being physically together, yet emotionally apart. When this lengthy segment was finished, the center curtain opened to reveal the scene from the other side of the stage. In that instant, each group knew they had seen something completely different. already very good finale then became great. As two tables were nested in the center, each performer took turns vaulting into the air and being caught by other cast members. It was a super joyful expression of falling forward in space, rather than away from something. Marlowe’s concept of audience collaboration in “Soar” was terrific. The logistics went off without a hitch and creating a successful link between choice and outcome is important in twenty-first century dance performance. But there was something else going on, something besides collaboration that also made “Soar” a conceptual success. This contemporary dance work really examined the word ‘soar’ from a three hundred and sixty degree perspective. Soaring happens in a variety of ways; it is not only about flying. Soaring is being carried, walking, falling, flapping, being thrown, being caught, running. Marlowe’s “Soar” for LEVYdance is about living to the fullest and thriving in any environment – a composition that seeks (and gains) a complete, full understanding of this single word.